The year, 1885. In California’s great Yosemite Valley under the misty expanse near Bridal-Veil Falls, a party of silver and wannabee gold miners discovered what was to become the mystery of the decade. While having lunch, Mr. G. F. Martindale who was in charge of a party of miners, noticed a pile of stones that was placed against the wall of a cliff. “As pretty as any wall on any building that I have ever seen” is the way one miner described it. Thinking that they had perhaps stumbled upon some lost treasure, the party of miners proceeded without delay and issuing great haste began tearing down the wall to get to the incredible riches that surely must lie within. Disappointment fell a heavy weight upon their heads as, in the end, they found the vault empty save a very large mummified corpse that lay on the ledge, which was carved from the natural stone for the express purpose of burial. What they found was another vault that had been carved from natural rock – 9 feet 3 inches high, 18 feet 6 inches deep and 8 feet 4 inches wide – containing a tall mummified corpse that was 6 feet 8 inches tall. The corpse was wrapped in what appeared to be animal skins and covered with a layer of fine gray power. 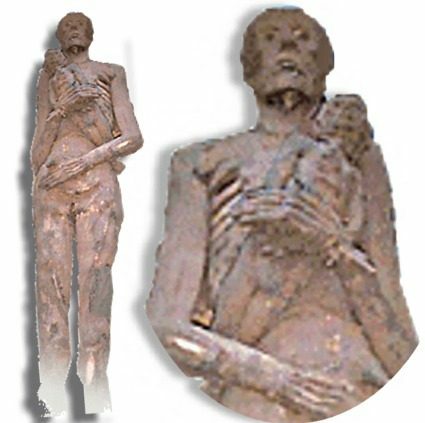 The miners removed parts of the animal skins to view the corpse and found it to be that of a woman holding a child to her breast. The mummy was then taken to Los Angeles where it was placed before men, considered to be of great science in those days, most of whom agreed that is was a “relic” from a race that must have inhabited this country long before the American Indian. Tall people, they claimed, from a race which preceded the coastal natives? All agreed that the height of 6 feet 8 inches tall in death must have represented an actual height in life of about seven or more feet. If their height relationship between men and women was approximately what it is today, then they concluded the males of the species could possibly have been some eight feet tall. The most popular theory of the day was that the lady was a relic of some royal family of a lost Stone Age tribe of giants. Interestingly enough, Captains Cooke and Magellan both wrote in their ship’s logs of a race of giants that inhabited what we now know as the Pacific coast of South America. Cook was even supposed to have captured one of the giants reported to be nine feet tall. Unfortunately, the giant escaped by breaking the ropes that bound him to the mast and jumped off the ship, overboard into the sea. In an additional excerpt, Capt. Cooke wrote in his log that he was himself was 6 feet 3 inches tall, (which was very tall for those days when the average was about 5 feet 4 inches tall and under) and he could easily stand under the arm of the giant. Cooke’s report started a furor that was to last another 100 years and cause many to seek these giant people. In the next century, many reports were filed stating that various of our major explorers had sighted the giants of what was then called Patagonia – but none had contact or for that matter even attempted to capture one of the giant men. Then suddenly, around the year 1650, the reports of sighting giants stopped abruptly. Perhaps the giants moved inland, perhaps because they moved far away. They couldn’t have just vanished. They could have simply become unpopular attractions and thus slipped gradually into oblivion. The fact remains that once up a time, they were there. The Yosemite Valley, where the mummy was found has always been considered to be a place of great mystery by the Indians who lived there, the Ahwahneechee. The folklore of the Ahwahneechees relates a story of a giant who came into the valley long before the white man arrived. The giant’s name was Oo-el-en. They were vicious giants for they liked to eat the meat of the Indians. Oo-el-en would catch the adults and carry them away to a hiding place near the foot of Cascade Falls. Oo-el-en would then cut the people into small pieces, hanging their meat in the sun to dry into jerky. The legend says that the Ahwahneechee finally killed the giants and burned their bodies. This rules out the possibility that the giant mummy of the Yosemite Valley might have been Oo-el-en. However, if there was a giant, where did he come from and was there more than one of her kind. We may never know – sadly, all the Ahwahneechee are dead, the last having died in 1947. The one thing the Ahwahneechees did leave was a written record of their long and complex burial rites. These Indians usually burned their dead – as they believed that by doing so they released the spirit of the deceased more quickly, so as to escape the evil spirits that lie in wait to grab it. The important part of the ritual in relationship to the mummy of the Yosemite Valley was that they always wrapped their dead in skins of animals before they were burned. If you recall, the mummy of the Yosemite Valley was wrapped in the skins of animals and covered with a fine gray powder. Ashes, perhaps? It is important to note at this point that the Ahwahneechees were also very small people, most being less than 5 feet 3 inches tall. However, there have been traces of a much earlier people that have inhabited the Southwest. This fact was pointed out dramatically in 1866 by a miner name Mattison. No real discoveries have been made since that time by anyone other than qualified archaeologist because it was about that time the advent of mechanized mining began. Mattison, from Angels Camp, California, found a skull almost 130 feet underground in the underground shaft of his mine in Calaveras County, California. The discovery shook the foundations of the Genesis itself. What intrigued Mr. Mattison was why an Indian would dig a grave that deep in the ground when most were buried at about 6 feet. He knew the skull belonged to a very old Indian because it was fossilized and encrusted with the same kind of gravel distinctive to the earth in the mine shift. He took it to one of the bars in Angels Camp on his next trip to town. There, he came across a doctor who told Mattison that if it was an Indian, it was a deformed one. The doctor pointed out the heavy to thick brow ridge which ran across the eyes and nose – he pointed several other differences in the cranium between this and other Indian skulls of more contemporary period which were occasionally dug up around those mining camps. The unknown doctor prevailed upon Mattison to report the find to Mr. J. D. Whitney, a geologist, and when shown the gravel-encrusted skull, he checked it with the gravel in its burial place and found the two to match. The skull had been found under four strata of lava and three strata of gold-bearing gravel. Thus Whitney reported it probably had been buried near the end of the Pliocene Era – a million years earlier. Was it a human skull or was it the skull of some man-like creature that walked the California soil a million years ago? Indian lore teaches us that there were creatures that ruled here long before the Indians came. According to some, they are still here, unseen by all but a few who have been lucky enough to spot a Bigfoot or a Sasquatch, or in other countries, a Yeti, a Nguoi Rung, a Chinese Yeh-ren or the Kapre and so forth. Was the Ahwahneechee Giant of Yosemite Valley related to a Sasquatch? If you recall, the mummy found in Yosemite was 6 foot 8 inches tall, which represented a height in life of close to seven feet. Was the mummy a Sasquatch, or are the Sasquatches the evolved ancestors or mutated ancestors of the mummy of the Yosemite Valley. Perhaps a hybrid? Was the skull found in Calaveras County the forerunner of both of these species, one which vanished completely and the other forced to go back into the ancient ways of the forest hiding forever from Man? The facts are there and they are undeniable. The conclusions are and must always be yours. I am still in the process of researching Calaveras County files and newspaper archives for a better description of the skull. If anyone has any information related to these events or newspaper clippings or other archival resources for the Ahwahneechees or historic Angel’s Camp, California [other than the internet] I would appreciate hearing from you.